Social housing is under attack, especially in London where estate demolition and regeneration have the potential to rake in hundreds of millions in profit for councils and property developers. And in this attack, it’s Labour councils leading the charge. Southwark’s Labour councillors have long and well-documented links with property developers: their demolition of over 1200 homes on the Heygate Estate in Elephant & Castle was supposed to be replaced with around 2,500 homes, of which only 500 would be for social housing. After developer Lendlease got the contract, this went down to 82 and to date there are ZERO social housing units on the development where Heygate once stood, all the flats having been sold to foreign investors. Southwark council are also currently in the process of demolishing the Aylesbury Estate, with over 2700 dwellings housing over 7000 people. Newham’s Labour council and Mayor Robin Wales who in 2014 evicted almost thirty homeless mothers from the Focus E15 shelter in East London. While the council claimed they had nowhere to rehouse them, the mothers pointed out that the borough’s nearby Carpenters Estate in Stratford had 600 empty homes on it. That estate, too, is being depopulated and prepared for demolition. Similar stories could be told of estates in pretty much any Labour-run borough in London. Tens of thousands in social housing units to be demolished. Millions to be made by councils and property developers. Image by Architects for Social Housing. Homeless people also often find themselves the victims of Labour councils’ ire. Vulnerable rough sleepers who decide to pitch tents near each other for safety in so-called ‘tent cities’ have been attacked by Labour-run councils in Bristol, Hull and Leeds using injunctions to clear the site and ensure they couldn’t reassemble elsewhere.. Similar injunctions were used by Manchester City Council against the homeless setting up camps in the city centre under the previous mayor, Richard Leese. Since then, new mayor Andy Burnham pledged to drive down homelessness in the city, though campaigners remain sceptical, with one of his first appointments being that very same Richard Leese for Deputy Mayor. As recent as April this year, Brighton and Hove City Council used a Public Space Protection Order (PSPO) to stop homeless people from sleeping along the seafront or in the city’s parks as well as clearing a homeless encampment next to St Peters Church on land not covered by the PSPO, which campaigners said offered no legislative grounds or paperwork. Not only is Brighton and Hove City Council led by Labour but its Labour Party has huge involvement from Corbyn supporters: in February and March 2017, internal elections saw 29 out of 30 executive positions filled by candidates supported by the left of the party while almost all of of the 30 delegates to this weekend’s conference support Jeremy Corbyn. Birmingham bin workers striking against Labour council redundancies. The Birmingham bins dispute has been rolling on now for months and originates from the Labour-controlled Birmingham City Council’s attempt to cut costs by making over 100 workers redundant and downgrading some refuse staff’s jobs, resulting in pay cuts of around £4000. Furthermore, refuse collection teams are made up of three workers: one driver and two at the back collecting rubbish, one of whom is responsible for safety. By getting rid of one of those roles, the Labour council is putting the remaining worker’s safety at risk. On top of that, a provisional deal had been hashed out between the council, the union and Acas in mid-August. Yet only two weeks later - notably once bin staff had cleared the rubbish that had piled up during their strike - the council went back on their agreement and issued workers with redundancy notices anyway! And only a few days later, they started advertising for the new downgraded and lower paid role. The Durham Teaching Assistants’ struggle has seen their employer, the Labour-run Durham County Council, attempt to cut the pay of 2,700 workers who are already amongst the lowest paid in the country. Nonetheless, the council has a attempted to rewrite their contracts so that TAs will be only be paid during term time rather than throughout the year. The result is a staggering 23% pay cut; with Durham TAs earning around £20,000, that would cut their pay by almost £5000 a year. The original plan was to sack all Durham TAs and re-employ them from January 1st 2016 under the new contract and, had it not been for the militancy of the TAs, that is exactly what would have happened. As it is, after two years of struggle, the TAs managed to force the council to bring them an improved offer (after rejecting multiple previous attempts) earlier this month, which they are currently discussing. One accusation thrown at left-wing critics of the Labour Party is of ‘purism’, abstract ideology and no practical alternatives. 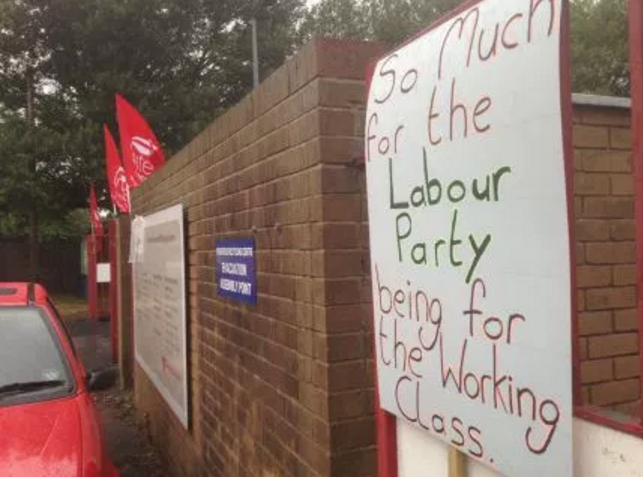 But these examples of Labour attacks on working-class people are anything but abstract: they are real people whose pay, conditions and housing are being eroded by decisions made by Labour Party officials. At the national level, Labour in opposition is supporting the end of Freedom of Movement as the UK leaves the EU. Corbyn’s references to the ‘wholesale import’ of workers reinforce ruling class attacks on migrants workers’ wages and conditions under the pretense of concern for those of British citizens. Strikes by mostly migrant university and hospital cleaners and Deliveroo riders show that migrants are often at the forefront of driving low wages up via workplace organisation rather than pushing them down, while May’s ‘hostile environment’ and the withdrawal of Freedom of Movement will make people easier to sack and evict. Corbyn’s support for an additional 10,000 police officers on the street continues a complete lack of opposition to state violence in the wake of the deaths of Edson da Costa and Rashan Charles in Hackney and Newham this summer. The resistance to these attacks also show the very real practical alternative to party politics. Attacks on social housing have been resisted by community groups that make up the Radical Housing Network and the activism of groups like Housing Action Southwark and Lambeth has in some cases meant people not losing their homes. Meanwhile, the resistance of workers in Birmingham and Durham show how workers can fight employer attacks on pay and conditions. Not by waiting for Labour politicians to step in on their behalf (if they had, they’d be thousands of pounds poorer by now) but by getting organised and taking direct action. Left-wing Labour activists might say it’s not an either/or choice. Perhaps they’re right. But so far that’s abstract ideology. The ball’s now in their court to show how Labour can do party politics and grassroots activism at the same time, and who they’ll side with when, as in the examples above, the two come into conflict. Timely article. And the Revolving Doors info is very useful! Thanks for this, it's exactly the kind of ammunition we need to argue against labour!